We had a good turnout at this year’s pool opening party. Thanks to all the people who helped. 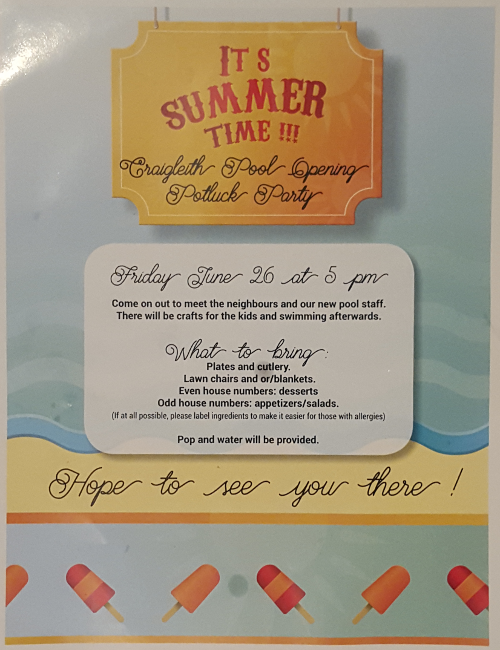 Our annual pool opening party is Friday June 26th @ 5PM. Click on the picture to the left for details. Please come out and say hi to your neighbors! Linked below is the tennis lesson registration form for 2015. The tennis lessons last eight weeks with four sessions from July 6th to August 28th. If you would like to attend lessons please fill out the form and return it to the pool staff before the desired session starts.